We're not sure what to call this one, it's kind of punk rock, but it's also kind of justplaindumb rock. The Infernos featured Paul Spence, who would go on to star in the absolutely fantastic Fubar (we should have mentioned the Fubar connection when we posted the A-Team, as well - but we didn't, because we assumed you know) and play in the equally fantastic CPC Gangbangs. There's a nice little piece over at the f-word about a reunion show they did, which indicates that this is just one of two tapes they put out. As always, we're happy to digitize any tapes you may want to send our way. 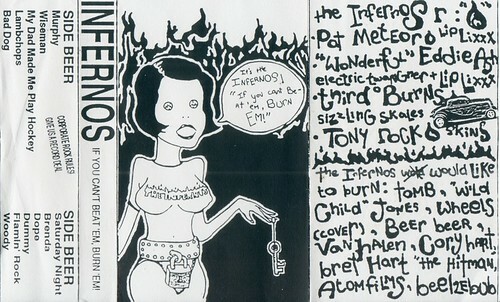 the infernos line up also included Pat Kelly of YTV and "Good Morning World" fame and Mike C of Il Giardino fame.